After 4 weeks of rising costs, Hendersonville mortgage rates finally recede. The rise in July’s Pending Home Sales Index reading is important for two reasons — both of which highlight a U.S. housing market in recovery. Buyer and sellers in Asheville and across the country would do well to pay attention. From this, we can infer that the rate at which homes are selling in South Carolina and nationwide is approaching the same “stimulated” levels that the tax credit afforded two-plus years ago. The difference is that today there are no buyer tax incentives. July’s New Home Sales report highlights what today’s buyers of new construction and the nation’s home builders have witnessed for themselves already — that the market for newly-built homes is improving in Hendersonville and nationwide. Because economists believe that a 6.0-month supply represents a market in balance, the current new home market is decidedly a “sellers market”. 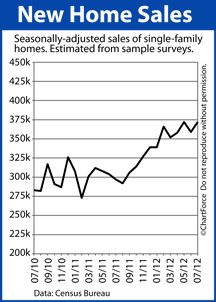 Buyers throughout South Carolina should expect higher new home prices ahead. June’s HPI gives buyers and seller in Hendersonville reason to cheer, but it’s important to remember that the Home Price Index — like so many other home valuation trackers — has a severe, built-in flaw. The HPI uses aged data. It’s nearly September, yet we’re talking numbers from June. 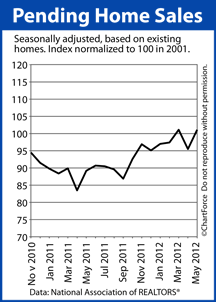 The Home Price Index is a useful housing market gauge for law-makers and economists. It highlights long-term trends in housing which can assist in allocating resources to a particular policy or project. For home buyers and sellers throughout North Carolina , however, it’s decidedly less useful. Real-time data is what’s most important. Homes & Money Newsletter (3rd Quarter 2012) (8.5×11). Mortgage markets improved last week. Mixed data highlighted the U.S. economy’s slow, steady expansion; the Federal Reserve changed market expectations for the new stimulus; and, sovereign debt concerns moved back to the forefront in Europe. Conforming mortgage rates fell last week for the first time this month, breaking a 4-week losing streak that had stymied would-be refinancing households in South Carolina and nationwide. Mortgage rates had been higher since the start of August. In published minutes from its July 31-August 1, 2012 Federal Open Market Committee meeting, the Federal Reserve revealed that, absent “substantial and sustainable” economic growth, many of its members believe further monetary easing would be warranted. Recent data shows that growth may be sustainable, but it’s hardly substantial. Should the Fed add new stimulus, it would likely come in the form of a third round of quantitative easing, a program by which the Federal Reserve purchases government-backed bonds on the open market, including mortgage-backed bonds. The new-found demand for bonds helps raise their respective prices which, in turn, moves down their respective yields. 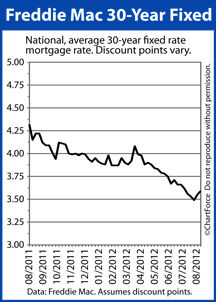 “QE3” would push mortgage rates lower, likely. It’s not expected to be released (if at all) until the FOMC’s next scheduled meeting, September 12-13, 2012. There is a small chance it’s announced this Friday, however; the Federal Reserve is meeting in Jackson Hole, Wyoming for its annual retreat. For this week’s rate shoppers, this week is filled with data and rhetoric. 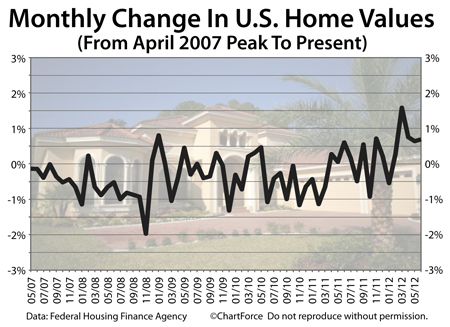 New U.S. housing data will be released along with recent inflation statistics. Both have the ability to cause mortgage rates to rise. In addition, second quarter GDP figures will be revisited and revised. If they’re revised lower, Fed-led stimulus may be more likely. Lastly, Eurozone leaders reconvene to discuss the terms of Greece’s bailout. 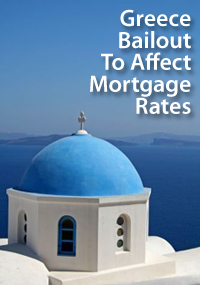 If terms are changed for the worse for Greece, mortgage rates may drop in a bout of safe-haven buying. Mortgage markets worsened last week as the investors moved back into risk-taking mode. Better-than-expected economic data in the U.S. plus a general feeling that the ongoing Eurozone issues will be soon be resolved (or lessened) contributed to a second straight week of rising mortgage rates. One such data point was the weekly Initial Jobless Claims report. According to the U.S. Department of Labor, the number of U.S. workers filing for first-time unemployment benefits unexpectedly dropped 6,000 from the week prior on a seasonally-adjusted basis. Economists had expected a week-over-week increase. In addition, government-backed mortgage securitizers Fannie Mae and Freddie Mac both announced quarterly profits last week of a combined $8.3 billion. This, too, reflects well on the economy because both companies attributed strong results to a recovering housing market. 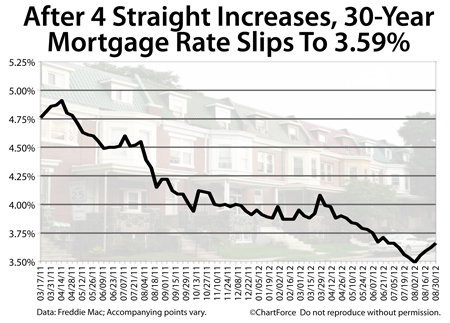 Conforming rates rose for the second straight week, according to Freddie Mac’s weekly mortgage rate survey. The 30-year fixed rate mortgage rate now averages 3.59% nationwide for mortgage applicants willing to pay 0.6 discount points plus a complete set of closing costs where 1 discount point is a loan fee equal to one percent of your loan size. This is a 10 basis point increase from late-July, when rates averaged 3.49%. The 15-year fixed rate mortgage also moved higher, registering 2.84% last week after recently posting at 2.80%, on average. This week, there won’t be much data to move markets. We’ll see the release of the Producer Price Index and the Consumer Price Index — two inflationary gauges for the U.S. economy — as well as July’s Retail Sales report. Beyond that, however, there won’t be much. Therefore, be wary of day-to-day momentum in the mortgage bond market. Between January and July, momentum took mortgage rates lower; eventually to an all-time low. Since August 1, however, that momentum has reversed. If you’re floating a mortgage rate or are otherwise not yet locked, get with your loan officer quickly. Mortgage rates may fall between today and Friday, but there’s much more room for rates to rise instead.